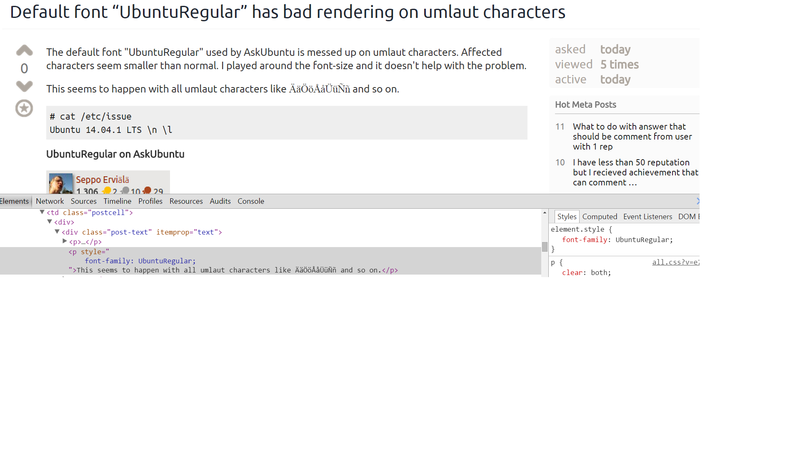 The default font "UbuntuRegular" used by Ask Ubuntu is messed up on umlaut characters. Affected characters seem smaller than normal. I played around the font-size and it doesn't help with the problem. This seems to happen with all umlaut characters like ÄäÖöÅåÜüÑñ and so on. Given that there are not too many posts with umlauts on AU this still looks very weird in running text, see the example. Named UbuntuRegular (no space) Note how the lack of fall-back families causes these characters to be shown in Serif font. I'd say the family should be set to 'Ubuntu Regular', Ubuntu, 'Bitstream ... instead of the current UbuntuRegular, Ubuntu, 'Bitstream Vera Sans... .
Not the answer you're looking for? Browse other questions tagged bug style font .